Part of the reason it’s lower is because some of what was in there is now in Googong. 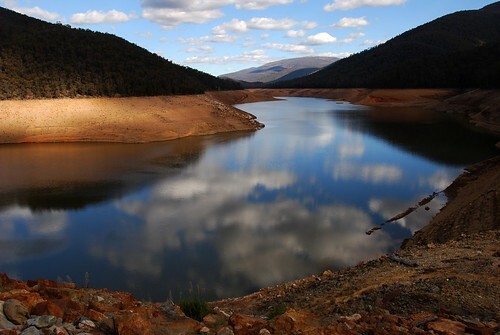 In last few months water levels have increased by about 10% of total storage capacity. Nice photo, but I really don’t like the subject matter. Emptying water sources are a sad sight. That does not look healthy at all. It’s a long way from full. Being a concave shape, it’ll take progressively more water to visibly fill. I saw that same ring of clouds over Lake Burley Griffin and wished I had my camera with me! Thanks, stunning!